Nottinghamshire’s cricketers revert back to the white ball format for an important cup tie at Trent Bridge tomorrow. The county lost a physically demanding four-day match at Somerset over the last few days but must now pick themselves up for their home knock-out match against Kent in the Royal London One-Day Cup. 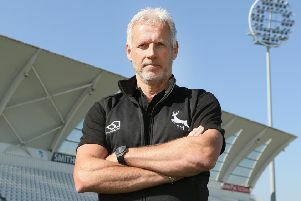 Head Coach Peter Moores expects his players to be ready. “Most of the time it’s 24 hours to enjoy a win or 24 hours to mourn a loss – that’s usually how county cricket goes. “We’ll prepare properly, although we’ll have to be careful with the players because they’ve just had a game that was physical for everybody, especially the bowlers. Although there is little time to focus too much on the opposition’s strengths and weaknesses, Moores isn’t too concerned by that. “We tend not to focus too much on the opposition, we concentrate more on our strengths,” he said. “They are coming to our patch, so we’ll try and play our game. “It doesn’t mean we don’t play attention to them. Notts are the defending champions and would dearly love the chance of returning to Lord’s for another final. “We just hope we’ve hit our best form at the right time,” Moores reflected. “Early on we had a few changes, not dissimilar to last year, in that we’ve been trying to find the right balance. “I give credit to Steven Mullaney as captain - and also to the rest of the players because we have had to adapt quite a bit. Last year we had a strong pace attack, this year we’ve changed it, taking a bit more off the pace. There’s more spin, with Matt Carter coming into the side and we’ve found different ways of doing it. “But we’ve managed to create pressure on the opposition and have just won three in a row, so we go into this in good form and we’ll go in with confidence but know we’ll have to play well. Notts will be boosted by the return of Jake Ball from the England one-day squad and are also hoping to welcome Harry Gurney back to their starting eleven after the left-arm pace bowler came through a match against the Australian Aboriginal XI on Tuesday.